I recently came into a rather large collection of old gaming materials. I'm really not much of a collector, but I couldn't pass up this deal -- it was free. So I have a tonne of old D&D modules, and not much to do with them. In my twenty-five odd years of gaming I have only played two modules, The Sinister Secret of Saltmarsh and Egg of the Phoenix - and I have never actually DM'ed one. Lack of a FLGS and funds in my youth contributed to a general disinterest in modules. But now that I got them, I want to see what all the fuss is about. I figure I'll give these a read and see if I can find anything I might like to review. I have never read any of these products, and apart from little tidbits I've seen on other blogs really have no idea what they're all about. I figure what the hell it might be fun. An old guy reviews old modules that he never read or played in his youth - and now with great wisdom and brilliant insight cynically tears them apart ruining what little remains of his youthful nostalgia... or writes a small review on his RPG blog. 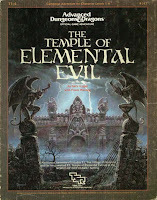 I started reading The Temple of Elemenental Evil over the weekend, so it will be the first one up on for the Old Module Review. I will try and have the first part of the review up by Wednesday if all goes well. Do you have a favourite classic module? Let me know, and if I have it I will review it. Let's see, I can't think of just one. B2 - Deceptively simple one that could turn into a TPK in the first encounter. Pharaoh series (I3,I4,I5 - I think) - This was my all time favorite series to run. It's just a complete blast and if you are going to review anything, I'd request this fun desert extravaganza. I definitely have the compiled Pharoah series, Desert of Desolation. I remember thumbing through this book in my youth and thinking it was pretty cool. I will do a review of it for sure. I have all the GDQ series, as well as N1 and L1 and they're going on the to read list. I have B2 but I just think Keep on the borderlands has been done to death. Because I've never actually DM'ed a module it might be fun for me to run one of these and write some play reports. I just have to do a lot of reading first. Did you read these posts that I did a while back? I compared the old version to the 3e version. 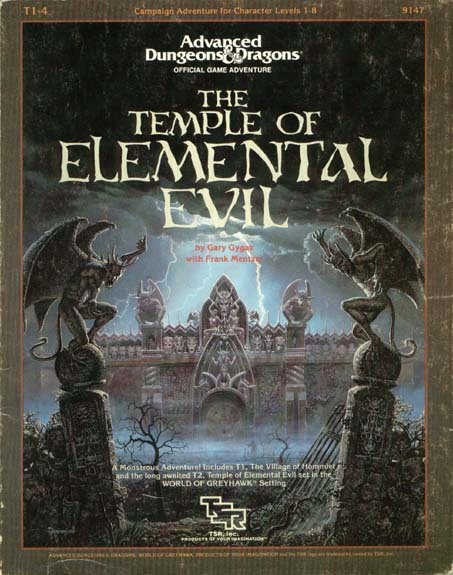 I don't play 3e and actually had no idea there was a 3e version TOEE so I will have to check out what you wrote for sure.